Ross Gay’s The Book of Delights is a genre-defying book of essays that record the small joys that occurred in one year, from birthday to birthday, and that we often overlook in our busy lives. His is a meditation on delight that takes a clear-eyed view of the complexities, even the terrors, in his life, including living in America as a black man; the ecological and psychic violence of our consumer culture; the loss of those he loves. More than any other subject, Gay celebrates the beauty of the natural world—his garden, the flowers in the sidewalk, the birds, the bees, the mushrooms, the trees. 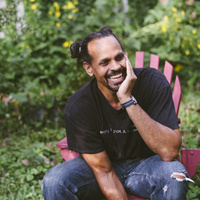 Ross Gay is the author of three books of poetry, including Catalog of Unabashed Gratitude, winner of the National Book Critics Circle Award and the Kingsley Tufts Poetry Award, Against Which, and Bringing the Shovel Down. He is a founding board member of the Bloomington Community Orchard, a nonprofit, free-fruit-for-all food justice and joy project. He teaches at Indiana University. The Ivy Bookshop will have copies of the book for sale at a book signing following the program. Writers LIVE programs are supported in part by a bequest from The Miss Howard Hubbard Adult Programming Fund.